Zürich Airport (LSZH) has been chosen as the default airport for the next FlightGear version, v2016.4. Some details about the airport can be found here. For all Git repositories on SourceForge, Edward d'Auvergne has updated the git-multimail repository hook script to 1.5-dev (the current master branch) from 1.2-dev, with a few customisations/simplifications for our commitlogs ML. If you see any error messages when committing, please report these. A failure of the git-multimail Python script will only result in a failure of the sending of an email to the ML, as this is a post-receive hook - the commit will have been successfully pushed/etc. Thanks to work by Florent Rougon, multiple apt.dat files (which contain airport data) can now be loaded, rather than the single $FG_ROOT/Airports/apt.dat.gz. These files (either *.dat or *.dat.gz) can be loaded from Scenery path/NavData/apt/, where Scenery path is any path specified by the --fg-scenery command line option. These will take precedence over the default one ($FG_ROOT/Airports/apt.dat.gz). 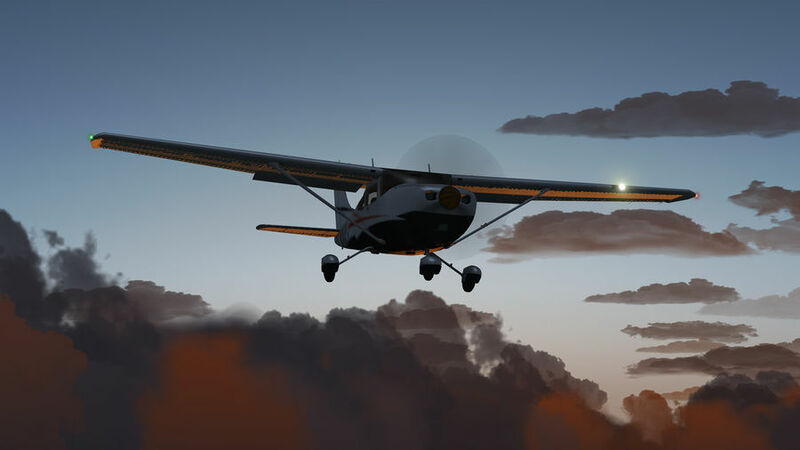 Note that any change to apt.dat files should continue to be submitted to the X-Plane gateway so that they will eventually be included in the main distribution. Hooray has been working on a dialog to easily develop, test and prototype new NavDisplay styles. It is capable of showing multiple NavDisplay instances, which can be controlled and tested independently (using different settings for range, modes, traffic, etc.). 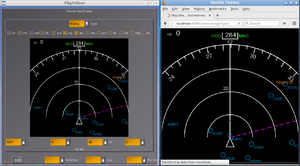 The dialog will also reload the styles file (navdisplay.mfd) when it is reopened (or the selected style changed), meaning that FlightGear doesn't have to be restarted every time changes are made. As of 10/2016, this is pending review by Gijs and Hyde before it can be committed to the base package. As part of the development of the Space Shuttle, Thorsten has added a Canvas-based ADI ball. However, it is somewhat of a resource hog. As can be seen from the screenshot of it, it is very complex and involves a lot of calculations. However, performance tests indicate that the cause of the bottleneck is the huge amount of property manipulation involved during each update, after the actual calculations have been completed. This has also been shown to be a problem for any very complex Canvas. Some ways to help reduce bottlenecks include using getprop() /setprop() instead of props.nas APIs and using variables instead of properties where possible. 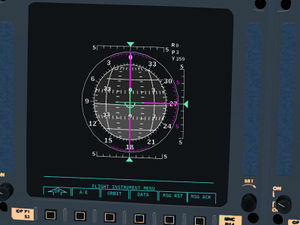 ThomasS has created a patch for FlightGear for downloading any Canvas image from a running FlightGear process via HTTP. This is useful for situations such as displaying instruments on a separate monitor. This should be considered as merely the groundwork needed for more sophisticated use-cases and a corresponding implementation. User HHS, the author of the Eurocopter EC135 P2, Eurocopter EC130 B4 and Cessna 182S Skylane is trying to the MBB/Kawasaki BK 117 into FlightGear. Unfortunately time is limited, so he will need help. When you have some spare time, are interested in helicopters, and always wished to improve things, you might want to apply for this job. Find out more on the wiki page. Auskunst is seeking help to improve the handling of his 2016 Camaro SS and another future automobile project. If you have experience in tweaking YASim FDMs, you can find out more here. psadro_gm has been working on an experimental terrain engine. It works by using shaders and raster images to form the terrain. As of 10/2016, it allows for terrain generation on-the-fly and changes in the level of detail (LOD). If the does get integrated fully, it will render TerraGear obsolete. However, there is still a lot of development work to do. The below videos show the change in LOD as one flies closer to the terrain. If you want to participate in the screenshot contest of November 2016, you can submit your candidate to this forum topic. Be sure to see the first post for participation rules. For purposes of convenience and organization, after all the entries have been submitted, a new forum topic will be started containing all shots in an easy-to-view layout. The voting will then take place there. Once the voting has finished, the best screenshot will be presented in the Newsletter edition of November 2016. ↑ chris_blues (Oct 4th, 2016). Re: Please vote for the next default airport. ↑ Edward d'Auvergne (Oct 18th, 2016). Re: [Flightgear-devel] Git-multimail repository hook script merge-request bug (was Re: apt.dat - add local version ?). ↑ Alant (Oct 18th, 2016). apt.dat - local version(s). ↑ Thorsten (Oct 28th, 2016). Re: Nasal must go. ↑ Thorsten (Oct 29th, 2016). Re: Nasal must go. ↑ Thorsten Renk (Apr 15th, 2013). Re: [Flightgear-devel] Nasal props API relative path support. ↑ ThomasS (Oct 10th, 2016). Re: Canvas remote drawing. ↑ psadro_gm (Oct 1st, 2016). Re: Next-generation scenery generating?. This page was last modified on 16 November 2016, at 11:41.